Sharice Davids Could Be America's First Out Native American Rep.
Davids, a mixed martial arts fighter, won the Democratic primary on Tuesday, and will compete against an anti-LGBTQ Republican incumbent. 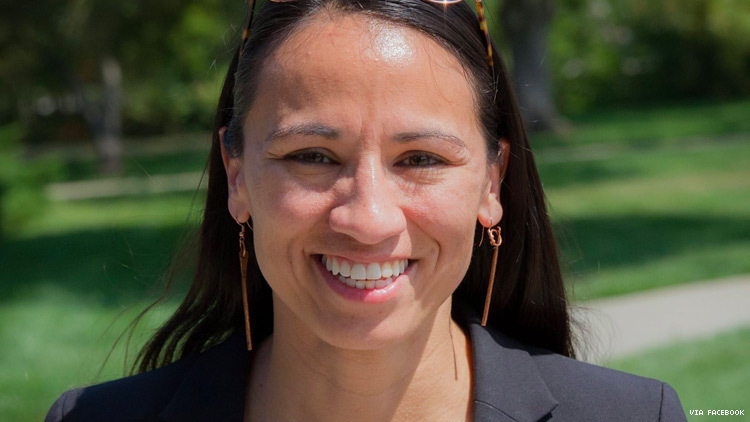 In a crowded six-way Democratic primary race for Kansas's 3rd Congressional District, Sharice Davids broke down barriers as the nation's first gay, Native American congressional nominee, reports the Kansas City Star. Come November, Davids, who is also a professional mixed martial arts fighter, will face off against Kevin Yoder in the general election. If she wins, she’ll make history yet again as Kansas’s first LGBTQ member of Congress and the first Native American woman to serve in Congress, according to a release from the LGBTQ Victory Fund. Davids, 38, has promised to fight for women, queer people, and the Native American community. She won the nomination at a crucial time in the state, when LGBTQ rights are being systematically eroded. Just this May, Kansas Gov. Jeff Colyer signed into law a bill that allows faith-based agencies to effectively deny LGBTQ people adoption rights. In 2015, then-Gov. Sam Brownback issued an executive order making it easier for religious-based groups to oppose marriage equality. Currently, Yoder is considered vulnerable in the 3rd Congressional District, where Hillary Clinton won the vote in the 2016 presidential election, according to the Star. Davids won the primary with 37 percent of the vote, while her closest competitor, Brent Welder, a progressive who ran on Bernie Sanders’s “Medicare For All” platform (for whom Sanders heavily campaigned), was her closest competitor with 34 percent of the vote. Victory Fund praised Davids’s win in a statement. “This victory shows the fighting spirit Sharice brings to her campaign and the progressive issues she cares about – so Kevin Yoder should be worried,” said Mayor Annise Parker, President & CEO of LGBTQ Victory Fund. “While Sharice speaks about inclusion and representing all her constituents, Kevin is chumming it up with Mike Pence, embracing the divisive and unproductive agenda that dominates the White House and so much of Capitol Hill.